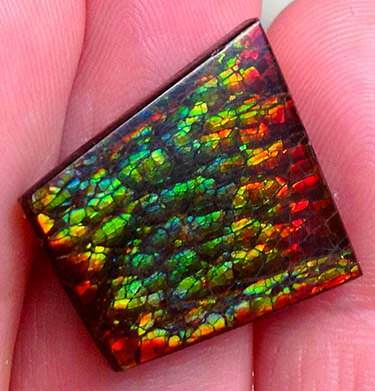 If you are a natural history buff, you will fall in love with ammolite from the moment you see it. This gemstone is resplendent with iridescent rainbow colors and resembles opal when it is processed into a polished cabochon. But it is the natural form of ammolite that will capture your imagination. Ammolite is part of a fossil! When you see an ammolite fossil, you may feel momentary confusion. You may think to yourself, “Wait, isn’t this ammonite?” They are indeed the same fossilized marine mollusks which lived during prehistoric times. Ammonite mollusks bear a strong resemblance to living nautili, so much so that nautili themselves are often called “living fossils.” In truth, however, ammonite mollusks were closer relations of cuttlefish, squid, and octopi. So what is the difference between ammonite and ammolite? Ammonite is the name for the fossilized organism itself. If you own one of the fossils, you own an ammonite. Ammolite is the name of the opal-like substance which forms on the shell and which exhibits the beautiful iridescent sheen. While you might be tempted to think that ammolite is not a true mineral since its origin is organic, this would be incorrect. Ammolite is a bit like petrified wood. Petrified wood is a fossil as well; the organic matter of the tree has been gradually replaced over time with mineral matter. The same has occurred with ammolite. The composition of that mineral matter in ammolite can vary quite a bit, but common constituents include aragonite, calcite, pyrite, and silica. Trace elements may include iron, manganese, titanium, aluminium, and many others. On the Mohs scale of hardness, ammolite measures a 4.5-5.5. 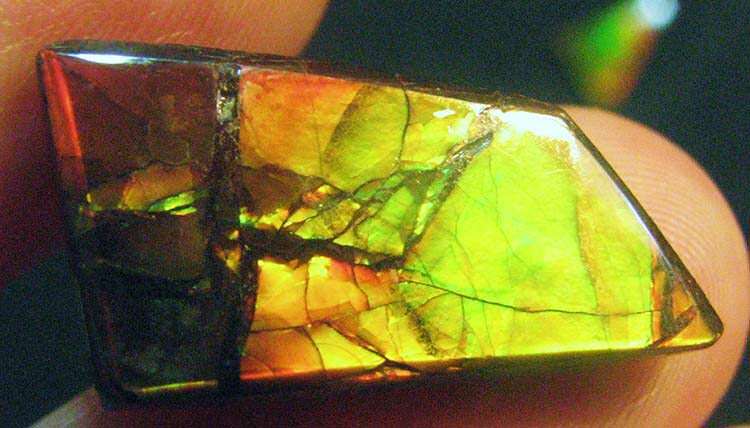 Exposed to ultraviolet light, ammolite will sometimes fluoresce yellow. When full fossils are recovered, ammonites can range quite a bit in size. The diameter of a large piece may be as much as 35.5 inches. Typically however it is the smaller specimens which exhibit the iridescent effect of ammolite. One of the most striking things about ammolite is its mesmerizing colors. Ammolite most prominently displays hues of red and green, but also showcases yellow, blue, brown, and other hues, often in a rainbow gradient. The microstructure of the aragonite is responsible for the bold display of colors. Thick layers of platelets tend to produce reds and greens while thinner layers result in blues and violets. Ammolite always forms in thin sheets. Since the thinner layers that result in cooler colors are so fragile, they often fracture. This is why the reds and greens predominate. Ammolite is highly unstable. Prolonged exposure to cold, heat, or sunlight can cause it to crack or flake. This gives its appearance a tessellated effect, resulting in various patterns. Each of these patterns has specific names like stained glass, dragon skin, cobblestone, moon glow, or sunset. 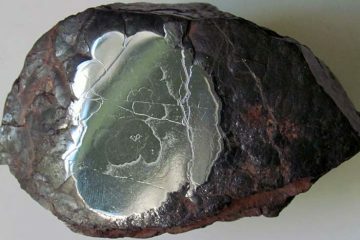 The surface of ammolite may be either smooth to the touch or display ripples. 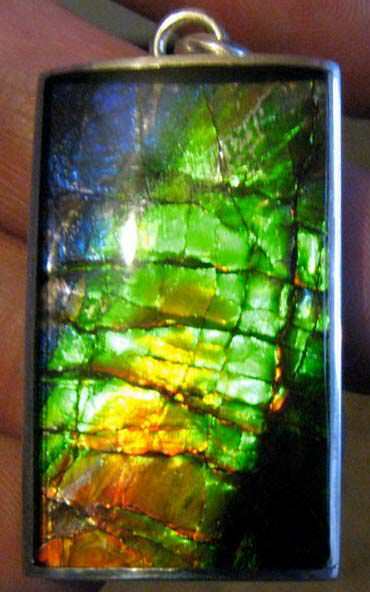 Ammolite has no industrial applications. Its use in jewelry is also limited. It was not until the 1970s that interest in ammolite jewelry really began to flourish in the western world. It is still in the Far East where ammolite remains most popular. If you are shopping for ammolite, it is important to know how to recognize a high-value piece so that you can get a fair price. A-: Colors are dark or pale with a dull luster. 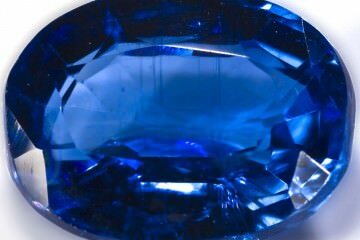 There is little chromatic shift when you change the position of the gemstone. The rotational range is 90 degrees. A: There is one vivid color or colors are pale. Iridescence is prominent, but not bright. There is a monochromatic shift and a rotational range of 180 degrees. A+: There are one or two vivid hues and bright iridescence. The stone exhibits a dichromatic shift with a rational range of 250 degrees. AA: Three or more colors are present and there is a brilliant iridescence. There is a spectro-chromatic shift with a rotational range of 360 degrees. As you can tell, the most valuable ammolite displays radiant iridescence, vivid hues, and amazing chromatic shifting between hues as you rotate the piece. Sometimes pieces may also be graded highly if they are part of a large or well-preserved fossil. Thankfully it is not easy to produce ammolite imitations, so most ammolites you see for sale are real. Occasionally someone may try to pass off a similar gemstone as ammolite, but this does not happen too often since most of the gemstones which bear a resemblance have great value on their own. In fact, you may sometimes see ammolite being passed off as an imitation of black opal! The closest imitation of ammolite you may stumble across is abalone. This is another iridescent shell, but it is quite common and inexpensive. Abalone may be dyed and capped with synthetic quartz, producing a chromatic effect similar to ammolite. These pieces generally contain air bubbles or concentrated dye which may be visible upon closer examination. Value for ammolite pieces can vary quite a bit. Usually ammolite jewelry will cost you in the range of $50-$500. If you wish to purchase an actual ammonite fossil, the price can vary tremendously. Small, lower-quality pieces may cost you less than $10. Large pieces which exhibit beautiful iridescence may cost you as much as $50,000. These are museum-quality specimens which are spectacular to behold. 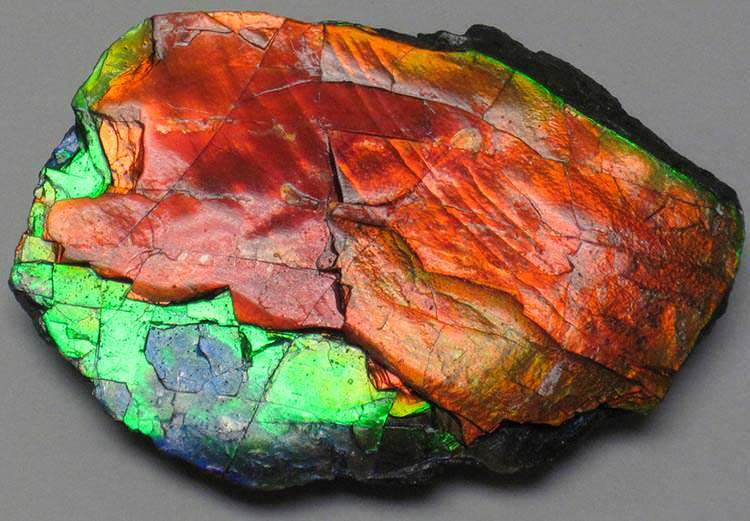 Oftentimes, ammolite is collected in its fossil form just as it is, and is displayed accordingly. Sometimes it is made into jewelry. This can be done in a couple of ways. You will find ammolite jewelry which actually uses the ammonite fossils, and you will find ammolite jewelry which contains polished cabochons. 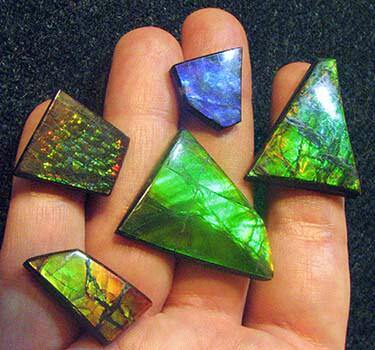 These cabochons are of course made out of the ammolite layer itself, and not the rest of the fossil. Since ammolite can be worked into cabochons, you can find pretty much anything made out of it. There are ammolite earrings, pendants, necklaces, bracelets, and everything else under the sun. Usually however when the ammolite is kept as part of the ammonite fossil and then used to create jewelry, this will be confined to pendants. This is for the simple reason that the fossils are generally too large for other uses. Ammolite jewelry made using cabochons has a wide appeal to buyers. It looks so similar to opal, and opal is a very popular jewel. Black opal is especially rare and prized, and so the fact that ammolite resembles that particular type of opal strongly makes it even more popular. 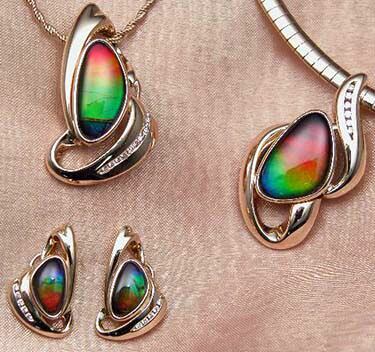 As to ammolite jewelry which features ammonite fossils, the appeal is rather more limited. Not everyone wants to wear a fossil since it is not very traditional. Among geology buffs however and those with more eclectic tastes, these pieces are very much treasured. You will often find ammonite jewelry in freeform settings. What about ammolite engagement rings? These are not very common, and they are not at all traditional, but they do exist, and they can make a great choice for an equally non-traditional recipient. Ammolite is captivating to behold. Its splendid iridescent sheen immediately catches the eye and holds it. It is mesmerizing to look at from all angles. Since it showcases every color of the rainbow, it can work great with any wardrobe. Because it stands out so much, it is bound to garner many compliments. Ammonite fossils with ammolite layers are beautiful and breathtaking examples of prehistory, preserved forever in a spectacular form. Ammolite would make a truly one-of-a-kind engagement ring unlike any other. You can be sure that it will be quite the conversational piece over the years to come. 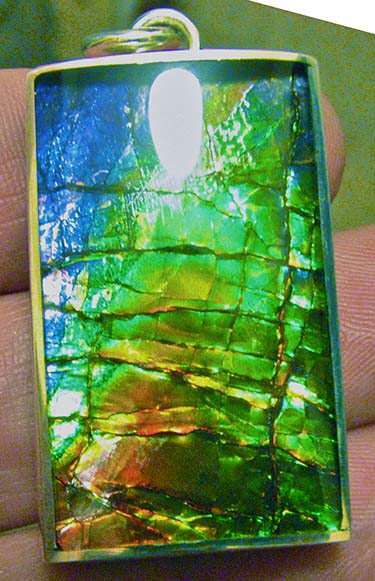 Because ammolite only rates a 4.5-5.5 on the Mohs scale of hardness, it is somewhat fragile. Add to this the fact that it is highly unstable, and you have to take extra care of it so that its appearance does not change. For this reason it may not be the best stone for everyday wear. Ammolite is not very traditional, so if you are thinking about getting it for an engagement ring, you will definitely want to check with your recipient first to make sure that she will be happy with this choice. Since ammolite can range widely in price, and many ammolite rings are not that expensive, ammolite may not be seen as representing commitment in the same way as a diamond (though if you purchase one of the more expensive pieces, this drawback obviously won’t apply). Cleaning ammolite is a task which must be undertaken with great care. 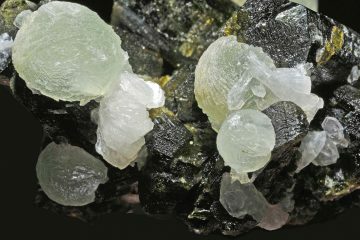 Because this is a softer gem, and may be attached to a delicate fossil, you will not want to go anywhere near it with a steam cleaner or ultrasonic cleaner. Always wash ammolite by hand, and avoid any kind of harsh detergent. If you have a fossil with nooks and crannies, get in carefully using an old, soft toothbrush. Rinse the piece gently and let it dry. Storing ammolite requires care as well. Since ammolite is unstable under heat, cold, or light, you need to make sure it isn’t exposed to any at length. If it is, it can crack and flake. While cracking and flaking in ammolite produces amazing patterns, if you want to preserve the existing appearance of your piece, you will need to take care to prevent further exposure. Keep it in a cool, dark, dry environment—but not cold. Make sure it is out of direct sunlight. And since it is relatively delicate, you need to store it in its own pouch away from other jewelry. Otherwise it can easily be scratched. Wearing ammolite should never happen when you are working with your hands or doing anything athletic. You also should wait to put on your ammolite jewelry until after you have done your makeup and hair routine so that you do not expose your jewelry to any harsh chemicals. There are two histories relevant to ammolite—the geological background for the gemstone and the story of its use in jewelry and art. The geological story dates back 70 to 75 million years. During that time, the Rocky Mountains were still in the process of forming. East of the mountains, there was a large water body called the Western Interior Seaway. This body of water was home to many different species, including sharks, shellfish, sea turtles, bony fish, and ammonites. During this period, rain falling onto the eastern side of the mountains was washing sediment down into the seaway. Over time, the sediments built up into a formation called the Bearpaw. Dead ammonite shed their shells into this sediment. The Western Interior Seaway is obviously gone now, but there are places where the Bearpaw Formation of sediment can be accessed along the eastern flank of the Rockies in Canada and the United States. These spots are in Alberta, Saskatchewan, Utah, and Montana. Throughout these areas, ammonite fossils have been recovered. Oftentimes, both the fossils and the ammolite layers are too badly damaged by the elements to serve as gem-quality specimens. Most of the gem quality ammolite has been recovered from an area alongside the St. Mary River in Alberta. Ammonite fossils found deeper underground usually are in better condition than those which have been exposed on the surface. It is worth noting that these are not the only places in the world where iridescent ammonites have been found. They have also been located in Madagascar, England, and Morocco. Unfortunately, the iridescent ammolite layers on these pieces are generally too thin to use in gem production or do not exhibit flashy enough colors. Ammolite has long been a gemstone prized by the Blackfoot people, who called it “Iniskim,” which translates to “buffalo stone.” Among the tribes, it represents prosperity, health, and luck. Specifically, stones that earned this name were ammonites which included four small bulges. This lends the image of a stylized buffalo. Myths and legends surrounding Iniskim have been passed down through the ages. 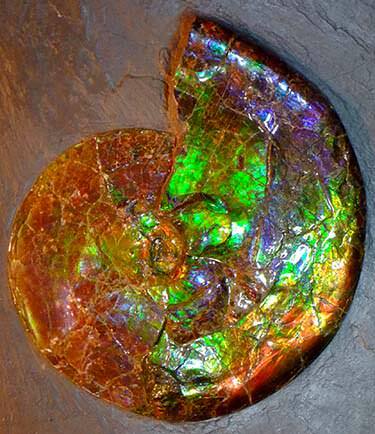 Ammolite became better known in 1908, when the Canadian Geology Survey described large iridescent ammonite fossils. A significant exhibition took place in 1962 in Nonton, Alberta. At this time, nobody was calling the material “ammolite” yet. That started in 1967 with Marcel Charbonneau. Charbonneau owned a rock shop and began selling the iridescent material and referring to it as “ammolite.” Charbonneau’s ammolite became popular, and demand among collectors and jewelry aficionados climbed. Ammolite was finally recognized as a gemstone in 1981 by the CIBJO Colored Stones Commission. In 2004, the Province of Alberta named it as their official gemstone. There are only two mines which currently produce gem-quality ammolite. Both are located in the Bearpaw Formation. One company is Aurora Ammolite Mine, the other is Korite International. Korite states in their promotional materials that they produce 90% of all ammolite on the market, worldwide. No one is sure how much ammolite there actually is in the Bearpaw. Extracting it is challenging, so it is entirely possible that ammolite’s value will increase in the future as supply drops. Most of the myths and legends surrounding ammolite come from the Blackfoot people, so the meanings associated with the stone are largely their meanings. Ammolite symbolizes wealthy, abundance, luck, and stamina. It is seen as a stone of great luck, perfect for embarking on an endeavor, and thus is a wonderful prize for a leader to find. Blackfoots believed that if you found the stone in the prairie, it was because it called to you. Interestingly enough, there are connections between ammonite and other cultures as well. 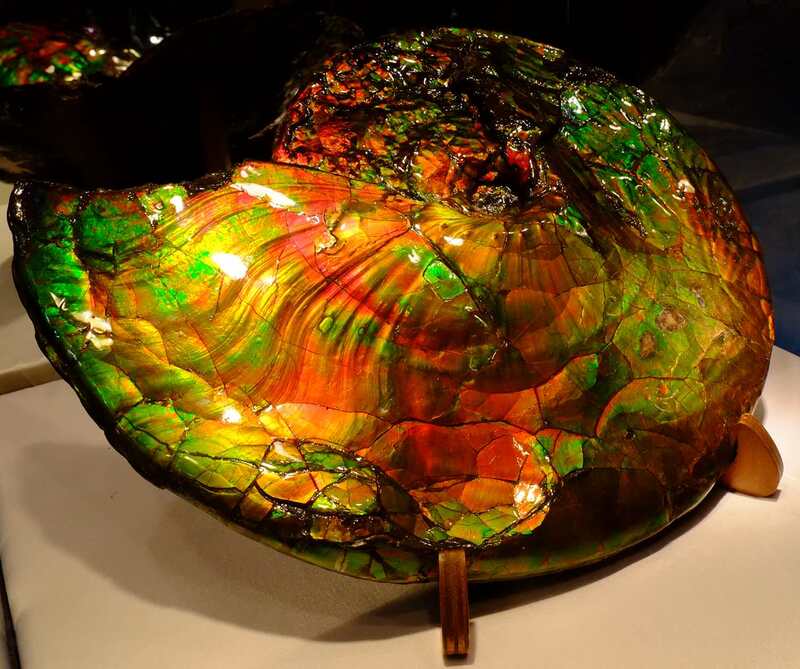 Even though gem-quality ammolite is confined to a relatively small region of the world, ammonites have been found elsewhere. There is a legend for example that the first discus used in the ancient Greek Olympics was an ammonite. In India, ammonites are associated with Lord Vishnu, and are referred to as Shaligrams. In Germany, ammonites were referred to as “dragon stones.” They were placed in milk pails to draw a cow back to milk. In Scotland they were also associated with cows; it was believed that if you washed a cow with an ammonite soaked in water, it would cure the cow of cramps. Ammonite is also associated with ancient Egypt. The name is derived from the Egyptian god Ammon. Ammon had a ram’s head, and ammonite fossils have an appearance evocative of a curled up ram’s horn. As a result, both ammonite and ammolite have many powerful meanings attached to them, meanings which date back thousands of years. They are treasured throughout the world by many cultures. A commercial by Korite International that gives a nice overview of ammolite. (It is a commercial however, so take any claims with a grain of salt). As distinctive as ammolite is, there are several different gemstones which are similar in appearance. Labradorite: Labradorite is a gemstone with a striking iridescent effect which is so unique it has its own special name, “labradorescence.” How can you tell it apart from ammolite? 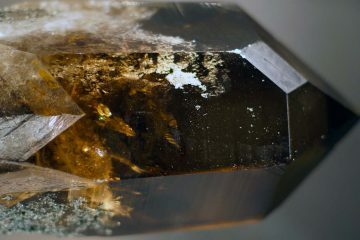 While both stones can feature a rainbow of hues, labradorite tends to occur in blues and greens, whereas ammolite is more likely to occur in greens and reds. Black opal: Black opal showcases a dazzling spectrum of colors which are generally quite close to those that are displayed by ammolite. As a result, it can be a challenge to tell the two apart. Ammolite is actually rarer than black opal, but black opal fetches a higher price on the market, so you will sometimes see ammolite posing as black opal. Abalone: Abalone is one of the most common substitutes used for ammolite, but it generally is not too hard to tell the two apart. Like labradorite, abalone tends to feature much cooler colors in the spectrum, especially blues, greens, purples, and silvers. Thankfully many of the patterns and fractures formed in ammolite help to distinguish it from other stones. If you see a pattern which is distinctive to ammolite, you are probably looking at real ammolite. The colors are usually a strong giveaway as well, at least for labradorite and abalone. These are the only two gems likely to be passed off as ammolite, since both are less valuable. Since black opal is more expensive, you really only need to be concerned about similarities between the two if you are shopping for black opal, not ammolite. Ammolite is one of the nature’s most beautiful gemstones. If you have an interest in natural history and a love of rich, vibrant, iridescent colors, a specimen of ammolite is a wonderful acquisition!